Object Type: Paintings illustrating exotic architecture became more frequent in the 19th century. British architects studied outside Europe as they searched for ideas for a new building style. These traditional forms were also threatened with obliteration by `the march of progress' and drawings had to be made to record them before they were destroyed. In his desire to preserve the exotic domestic architecture of Cairo, particularly the interiors, Dillon painted accurate pictures of them as a record and as a kind of advertisement for his campaign. He included their inhabitants in appropriate costume, to give scale and to make them more appealing. People: Frank Dillon (1823-1909) was part of the circle that had surrounded Owen Jones. Like many of those design reformers he wished to encourage interest in the decorative art and architecture of other cultures. He was actively concerned with efforts to preserve Islamic monuments of Cairo. He also travelled in Portugal, Spain and Morocco, as well in Japan where he studied and painted traditional Japanese interiors. The title derives from a watercolour of the same maqad (VAM, DPD, 852-1900); this is reproduced in Ebers, Vol.II, , p.82. For three further views of the house see VAM, DPD, 854, 860 & 861-1900, the latter dated 1870. Others, or the same, are recorded at the Dudley Gallery, 1876 (195), the RI, 1884 (271), 1888 (37), and in the artist's sale, 1911 (14).The bayt (house) was one of several structures built by Radwan Bay in the 17th century around the Sharia al Khiyyamiyyah, near the Bab Zuwaylah. 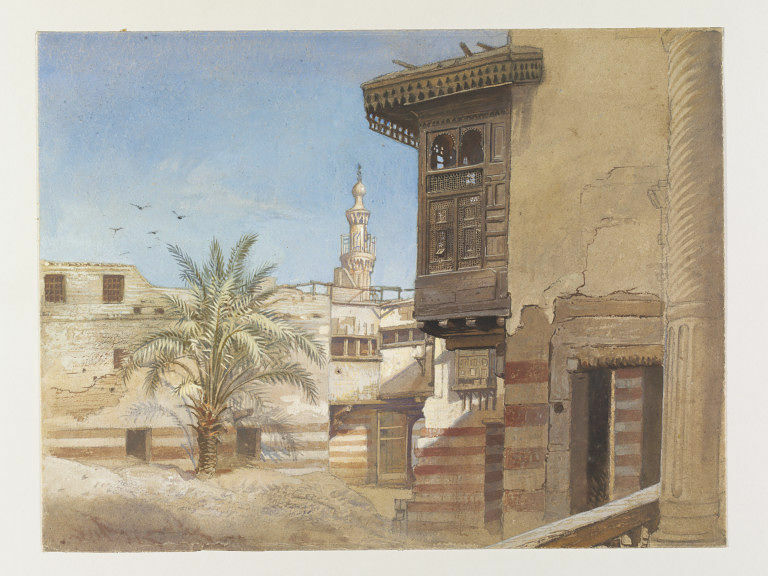 Dillon exhibited several views of Cairo houses at the RA, RI and Dudley Gallery: see Searight Archive. SD329-333 derive from the third and fourth of Dillon's visits to Cairo, when he became especially interested in its Islamic architecture. 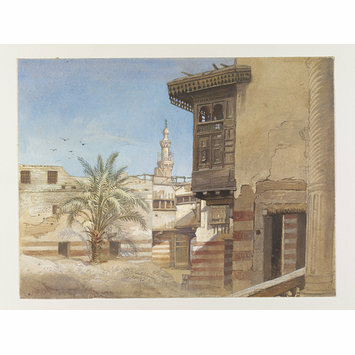 He made a series of watercolours of three Mamluk style houses, the bayts of Radwan Bay (SD331), Shaykh al Sadat (SD332) and the Mufti, Shaykh al Mahdi, including eleven acquired by the South Kensington Museum from Bryan Donkin, the artist's son in law, in 1900 (VAM, DPD, 852, 862-1900; see R.P's 84/814). For further details of the houses, see B. Maury, A. Raymond, J. Revault & M. Zakariya, Palais et Maisons du Caire, Vol.I, Epoque Mamelouke, Vol.II, Epoque Ottomane, Paris, 1982 & 1983. See also B. Llewellyn, 'Frank Dillon and Victorian pictures of old Cairo houses', Ur, 3 1984, pp.3 10; Searight Archive.